Chapter One: Old Threads Make New Tapestry—Rewiring of Signalling Pathways Underlies Caste Phenotypic Plasticity in the Honey Bee, Apis mellifera L.
8 Are There Commonalities Between Context-Dependent Signalling Pathways in Larval Caste Development and Adult Caste Function? 2 What Do We Mean by Reward? 5 Why Should Social Insect Researchers Consider the IGE Framework? 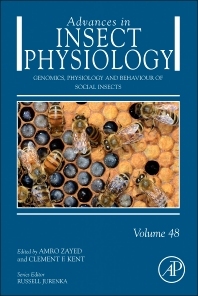 Physiology, Behavior, Genomics of Social Insects provides comprehensive information on the social insect groups described, including new and unique reviews on emerging model social organisms. The book's interdisciplinary approach integrates behavior, genomics, and physiology, providing readers with great insights into the present state of a rapidly expanding area of research. It also discusses areas where new research tools will bring hope to longstanding problems. students and researchers in the fields of physiology, behavior, and genomics, evolutionary biologists interested in how sociality evolves, and geneticists studying complex traits. Amro Zayed was awarded the Governor General’s Gold Medal in 2007 for his doctoral research on bee popualtion and conservation genetics. He held a Natural Sciences and Engineering Research Council of Canada’s Postdoctoral Fellowship at the University of Illinois’ Department of Entomology (2006-2008) where he worked on the evolutionary genomics of social insects with Dr. Charles Whitfield. Dr. Zayed then served as a Fellow for the Institute for Genomic Biology’s Genomics of Neural & Behavioral Plasticity Theme, led by Dr. Gene Robinson, at the University of Illinois (2008-2009). Dr. Zayed joined York University’s Department of Biology as an Assistant Professor in 2009, where he leads an integrative research program on the evolution and genetics of social behavior in insects. Dr. Zayed received the Ontario Government of Research and Innovation’s Early Researcher Award in 2010. Clement Kent began his studies with mathematics and computing, continued with statistics, stochastic models, and ecology, and ended up doing behavior and population genetics, genomics, and metabolomics. At divers points among these studies he worked in the computing industry, becoming CTO and Vice President of Research. He studied fruit fly genetics and social behavior with Marla Sokolowski and Joel Levine, honeybee population genomics with Amro Zayed, and now works on fruit fly neurobiology with Ulrike Heberlein at the Howard Hughes Medical Institute. In his spare time he likes to garden, do population genomics analyses of social insect genomes, hike, and socialize with social insect researchers.